Sultry Feeling has continued her unbeaten Autumn Carnival campaign at Rosehill Gardens this afternoon; completing an impressive performance to win the Group 3 Birthday Card Stakes (1200m). Sultry Feeling was charged with overcoming barrier 14 in the Birthday Card Stakes but did her chances of success absolutely no harm when jumping from the barriers well and settling in a good position just off the pace of Flashing Speed and Two Blue. Rounding onto the final straight somewhat wide and with plenty to do, the Encosta De Lago mare found a gap between runners and accelerated well to hit the line ahead of Lucky Can Be and Perignon. Blake Shinn partnered Sultry Feeling to success in the Birthday Card Stakes and was pleased to deliver trainer James Cummings a black type win. 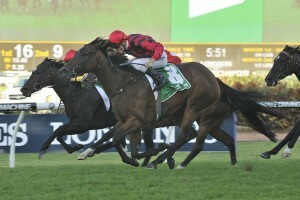 “Its been a fantastic day and it’s great to keep the winners going,” Shinn said. “She did a great job and our intention was to be a little positive but in the first 50m I just sensed they were going a little bit fast so took a hold on her and came out of the speed battle. “I ended up in a pretty good spot three deep with cover and I was confident she had a good finish because she’s proven that in the past. “I came out at the 400m with a lap full of horse, got to the front and star-gazed a touch and it nearly got me beaten late but she held on. Cummings was pleased with Sultry Feeling’s performance to win the Birthday Card Stakes and revealed he is eyeing the Group 2 Sapphire Stakes (1200m) on Day 2 of The Championships as the next point of call for the in-form mare. “I think it’s a real lesson in planning,” Cummings said. “The temptation is there when you beat a mare like Peeping (Coolmore Classic winner) first-up, but we knew she hadn’t performed second-up in previous preparations. “We didn’t draw the gate today and I didn’t get Hughie (Bowman) but I got Blake Shinn, who has just won the Slipper. “I was a little bit nervous when the horses on the fence loomed up on the inside because that’s been the place to be today. “She attacked the line and has had a bit of beach work in between (her last run and the Birthday Card Stakes) and she’s got the goods for us today. In taking out the 2016 Birthday Card Stakes, Sultry Feeling has now posted a commendable five wins and three minors through nineteen career starts.